Direct Mail for Dummies ANON. 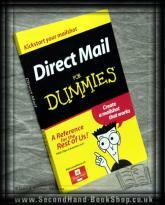 Direct Mail for Dummies - ANON. John Wiley & Sons, 2006, Paperback. Condition: Very Good. A slightly dog-eared copy. Whether you're brand new to direct mail or have a little experience with it, Direct Mail For Dummies is for you. This easy-to-understand book guides you through the direct mail process, pointing out tips and pitfalls along the way. From sorting out your objectives and creating your direct mail plan, to measuring responses and results, this get-started guide will have you conquering new markets quickly, easily, and affordably. Size: 8½" x 5½". 132 pages.